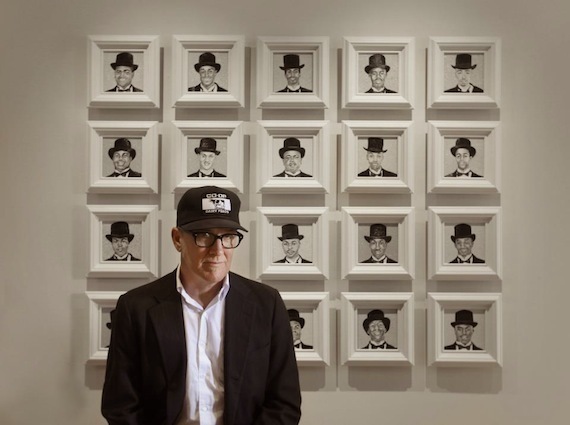 It’s been five and a half years since we last spoke with Lambchop’s Kurt Wagner – around the release of 2008’s OH (Ohio) – and it’s been a productive set of years. The group played an awe-inspiring set at Merge Records’ 20th Anniversary festival in 2009 – a show recorded and released for posterity on DVD and CD – and released the fantastic Mr. M in 2012. Now comes a re-release of their 2000 album, Nixon. Out this week via Merge, the package contains a re-master of the original album, plus a White Sessions recording from 1998. Earlier this month, we caught up with Wagner to discuss the reissue, their success in Europe around the album’s original release, its iconic artwork, and the unfortunate passing that made looking back on Nixon a bit tougher. Oh, and how a spot in the Country Music Hall of Fame gift shop would be just fine. Aquarium Drunkard: You have this really nice reissue of Nixon coming out January 28th. This is one of the first sort of purposeful reissues – as opposed to if something were out of print – that the band has really done. How much involvement did you have in the process of creating what this was going to look like? Kurt Wagner: Nixon actually had received the reissue treatment in Europe prior to this and I think they modeled it after that in terms of the packaging. Mainly the idea was presented that it had never been released on vinyl in the U.S. and that was sort of the motive – and then eventually grew into the idea that we should release some CDs as well. So they took the vinyl packaging as it appeared in Europe and presented it here. Then, of course, the additional stuff was stuff that I found around here. So I did dig around a little bit. It was prior to the digital age for the most part, so it was difficult to find things that weren’t on cassette. [laughs] It was either on cassette or two-inch tape or something pretty antiquated, so the archival part of it was a little limited because of the quality of the material of what I could find. AD: Usually people will pick albums to reissue on some sort anniversary basis. Nixon is 14 years old this year. So why select this as opposed to any other album in the Lambchop catalogue? Kurt Wagner: Well, I think Merge was looking at it mainly from their perspective at 25 years and they are trying to represent the scope of what they’ve done over 25 years and looking at this as part of their label and something that might represent a significant moment in Merge history or ours as well. I think that’s why it fell into a weird time frame. I think the whole notion of this series they’re putting out is to celebrate the sort of milestones of various bands or important records that they wanted to highlight as a label. AD: Nixon was one of your biggest entry-point records for the British market, right? AD: Back in 2001 there was a festival in London called Beyond Nashville that you played at with a big ensemble of people. You played with Vic Chesnutt. Kurt Wagner: Right. Howe Gelb was the ringleader of that and Vic was part of it, I was part of it. It was a big group of people. AD: Listening to Nixon, especially, I get a bit perplexed. As much as there are clearly elements of country music within the album, it still just pounds me over the head as a soul record in a lot of ways. So how did that happen? How did the band end up getting mixed in with all this? Kurt Wagner: You know, part of it was geographic and that we were from Nashville. And I think at that time, it was a jumping-off point. Here are some guys from Nashville that aren’t playing country music and what do you call it. But prior to that, and I think this is something that was a guiding principle of what we felt like we were doing as a band, was that we were from Nashville and trying to represent the creativity that could come out of Nashville that wasn’t country music. And yet, here we are in Nashville and part of what we’re doing is addressing that type of music and how does that influence what we do. And we certainly were conceptually looking at country music at that time, but not paying attention to trying to recreate it or emulate it. We were trying to be ourselves and do our own thing. And taking into account that Nashville not only had great country music coming out of it but also great soul music and gospel and other elements that we could sort of incorporate into what we do. The techniques, the studios, the sound – the Nashville sound – was all something we were aware of and it was something we wanted to see how we could fit into that by doing our own thing. Kurt Wagner: Right. We were doing back-to-back sessions that day. We sort of crossed paths and I finished my thing as they were arriving to do theirs. AD: Other than the relatively limited amount of stuff you had to pull from for the bonus material, why did you decide to include this in the re-issue? Kurt Wagner: Well, it was striking in that this was two years prior to Nixon being released. I was probably there promoting the previous album, What Another Man Spills, but one of the things I used to do when I would go out and do radio promotion stuff, is I would use it as an opportunity to perform stuff that hadn’t been recorded yet to see how they translate and see how they sound being recorded. So, oddly enough, four of the five songs I recorded turned out to be Nixon songs. That and there’s something about it. It’s pretty striking and spare and it’s just an interesting document. And to be honest, there wasn’t much else I could find that was appropriate. When I heard that, I thought, well, this could be interesting. And I sent it to Mac [McCaughan; Merge Records founder] and they seemed to really respond to it, thinking it was maybe a different side of what we could sound like at the time. It’s just me representing the songs with a little tape recorder with loops. AD: Do you go back and listen to your older music much? Or, if not, did you go back and re-listen to Nixon in the process of prepping this reissue and how is it revisiting things like that? Kurt Wagner: As a rule, I don’t really do it. One thing that does promote it is a reissue project or a compilation of rare stuff or something like that. So that does bring that sort of process to life. You sort of get involved in at least checking it out. Again, since this was the second kind-of reissue, I had gone there a couple of years prior to that. And so I was kind of familiar with the record. Naturally I wanted to check out the re-mastering and stuff like that, so I did want to check out the record that way. But other than that, it was just digging – the archivalness of digging through all this stuff I have. And it is interesting what ends up kind of surviving. [laughs] And it is an experience – I don’t know. It’s not a bad thing necessarily, it’s not an enjoyable thing necessarily. I do prefer looking forward rather than looking back. 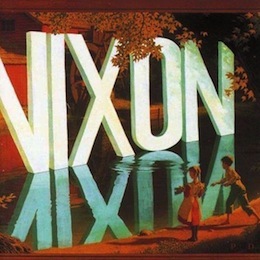 AD: The artwork on the cover of Nixon (by artist Wayne White) is this beautiful, idyllic country scene and the gigantic NIXON stretched out like some formidable monolith. You also have a list in the liner notes of additional reading concerning Richard Nixon, and ostensibly the record is about him, but not in a way that is at all immediately discernible. What made you decide you wanted to write and record an album about that? Kurt Wagner: I think the way to answer that is to sort of describe the chain of events that led to that. Lambchop seems to work – and especially at that time – in a very organic and natural way. We sort of would rely on each other and exchange ideas and things like that. And it was important to incorporate friends in the various aspects of what it takes to make a record. And my friend Wayne White, he painted the painting. One of the things we’d done was getting friends of mine who were artists that I liked their work to get to help us with the artwork. And this was sort of Wayne’s time and I called him up while we were in the process of doing the artwork and I asked if he had anything going on. He said, ‘yeah, I’m painting these paintings with slogans and things on them,’ so I asked him to just give me a list of all the slogans and it hit upon the one with ‘Nixon’ and it just seemed to ring a bell or whatever. And the relationship of what that word meant at that time and how it referred to the sound of what we were making – I don’t know – I just got some strange connection in my head about it. And then upon seeing the image, well, it just seemed perfect to me and seemed to fit. So then the challenge was how do you relate the music we were making with this strong image. Given enough time, I can pretty much draw a correlation between any separate objects. [laughs] So part of it was having fun with it and being facetious about it, but at the same time I kind of felt it was almost like a riddle that maybe even you don’t know the answer to, but you put it out there and it does promote thought and it does promote people trying to connect the two things. It’s also a simple, strong iconic word image that definitely I felt was as strong as the work we were making. So I thought they fit together in that way if nothing else. AD: I didn’t have a copy of the original issue of Nixon to compare with, but on the reissue, underneath the copyright information on the back of the CD case, it says “visit the country music hall of fame in nashville, tn.” Was that on the original record as well? AD: Well, I think we should start the lobbying process now. Kurt Wagner: Well, you know, just carrying it in the gift shop would be fine. AD: Sound wise, lyrics wise, anything – how do you feel Lambchop has changed since then? I know that’s a broad question – the band has slimmed down a lot since then, obviously. Kurt Wagner: Yeah, and it continued on into the next record. You know, it’s debatable, but I think the following record [Is a Woman] is equally as strong a record and remarkably different and equally as successful in Europe, more so in Germany than in England. So that period of time between the two records was kind of a high-point of recognition in Europe in particular. So, because of that, we started traveling and performing and touring a lot. And the reality of touring with that many people and that often, it did promote changes in how we were able to continue what we were doing. That and the fact that, at that point, we’d been making music for quite awhile and people’s lives were starting to change – having families and getting real jobs and things like that. Kurt Wagner: Yeah, that’s true. That happened right around the release of Nixon. AD: So that sort of speaks to what you’re talking about there. Kurt Wagner: Yeah. I don’t think I necessarily quit my job to throw in my lot as a professional musician. I just figured I’d get another job, but I never did. I just got more and more busy with music. And that became my job. It wasn’t so much ‘well, we’ve got a hit now, I’m gonna quit!’ [laughs] It really wasn’t about that. I think the whole notion of what we did as a band is that we could be a band, make music that people would like, but not necessarily give up the kind of life you wanted to lead. You didn’t have to devote your self and energies – there was a way to have a normal existence and be a productive and quality music person. So yeah, you get more attention and interest in what you’re doing, a lot more people want you to do it. So you try and accommodate the best you could. AD: So one more question about Nixon and how things have changed – where did the falsetto go? Kurt Wagner: [laughs] It went the way of the cigarette. I guess because I smoked too much or whatever, but it was always kind of a strain to do anyway. And it was very difficult to project it over a large band. So, I think at some point it just gave out. To this day, I go ‘how did I do that?’ And I try and do it and it’s just air coming out. [laughs] So I don’t have any real explanation for it other than I think I probably smoke too much. AD: Do you tackle those songs live still anymore or do you just sing them without it? Kurt Wagner: Yeah, we’re getting to the point where we play everything but about two of the songs. And we’re kind of batting around the idea of performing the record as a whole. We batted it around about six months ago when we talked about doing this. [laughs] But it’s highly possible. But there’s no falsetto and I think that’s part of why I didn’t revisit those songs prior to three or four years ago. The falsetto was kind of gone, the band was a different lineup and I associated a lot of things with that lineup. Particularly the members of the band – a lot of the attention gets focused on me, but it’s as much how we work together and the sounds they made and their contributions to it as far as ideas. And I think that’s an important part of presenting that music as it was. I’ve gotten past that, and there’s a way to present the music as we are now that’s equally as interesting, I think. AD: I guess if we’re reading between the lines of the Merge 25th Anniversary announcement from a couple of weeks ago, I’m going to assume that there’s not actually going to be a Lambchop Petting Zoo, but that you guys are going to play – and maybe even tackle Nixon in its entirety? Kurt Wagner: Well, what I may do is take that one step further and say, “Yeah, Mac, we’ll sit around in a corner and let people pat us on the head.” [laughs] Otherwise, I don’t anticipate bringing all our animals to the show. We’re talking about playing the record in its entirety. It’s really about how everyone feels about it as a band whether it’s something we want to do. I have been reticent to do it before, and we have been asked to do that in England especially before, but I have resisted it because I’m more of a forward thinker about things. And I just wasn’t sure I was ready to do that. But I guess now I’m sort of coming around to it and part of it was the experience of putting the record together. And part of it was the passing of one of the key figures in that record. That also caused me to have to look backward, reflecting upon your relationship with that person. You naturally think of those times. So it became a little painful in revisiting this music, particularly at the same time that Marc Trovillion [bass player for Lambchop] died. That made the prospects a bit bittersweet. I think the last time Merge had an anniversary was the 20th, and we performed basically with as many people as were available in the Lambchop family, and he was a part of that. It was tough. It was a completely unexpected thing when Marc passed away and it made things take awhile to sort of work through. And it was difficult just compounded with the fact that whatever I would have to do with the listening to the music – that’s a hard thing to do go back and listen to music from someone you’ve worked with who’s passed away. AD: Whatever approach you take, you’ve got a high hurdle because people loved that 20th anniversary performance. I certainly did. one of my favorites. great read. Glorious record. And I’m still bummed I missed the merge anniversary play.